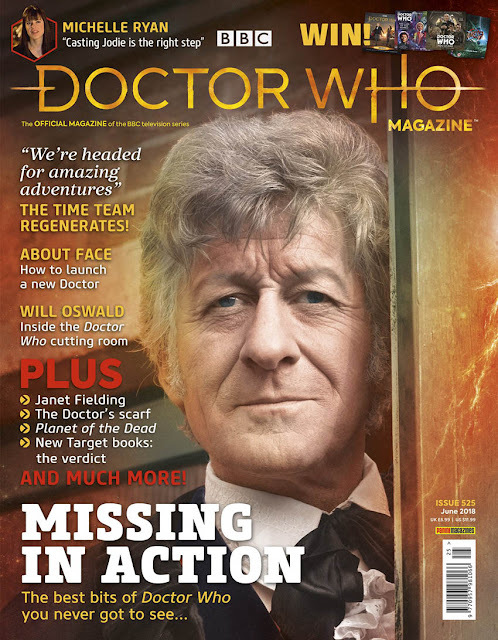 "There's a new issue of Doctor Who Magazine out this week! From cut scenes to edited-out characters, DWM 525 reveals the best bits of Doctor Who you never got to see. Plus there's an interview with Michelle Ryan, the Time Team regenerates and Out of the TARDIS with Janet Fielding!" 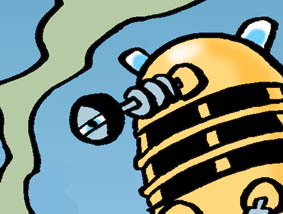 The 12th Doctor comic strip continues too, and there'll be another Daft Dimension strip from me featuring the Daleks! Grab your copy this Thursday! Available from newsagents, supermarkets, and comic shops. I don't think I'll be at this event myself but I'm giving it a plug here because it's well worth your time if you're an aspiring comics creator. 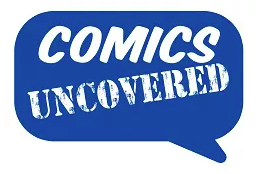 On 7th and 8th July, Birmingham will host Comics Uncovered, a two-day seminar with guest speakers presenting workshops, demos, and talks with revealing insights into comics creation. 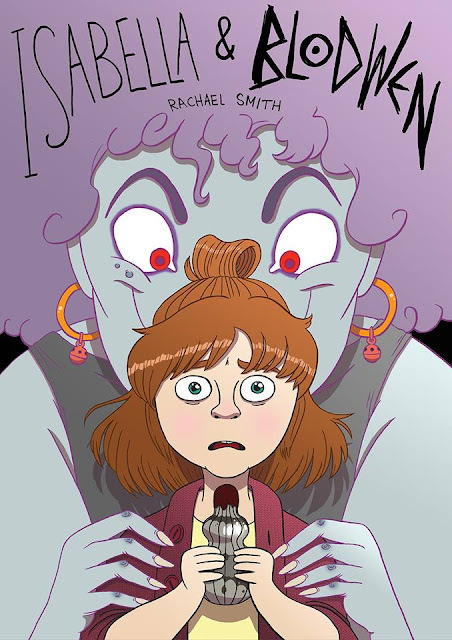 Have you ever wanted to be a professional comics creator? Or are you a professional looking to take your career to the next Level? Perhaps you'd like to be working for a major publisher or publishing your own comics? In the UK there are limited paths to careers for you. We know that, because we've trodden that same road ourselves. It is our mission to help you take those first steps, or perhaps even the most important steps, on that path and Comics Uncovered features over a dozen seminars, workshops, demos and master-classes conducted by top professionals, all aimed at creative people like you. 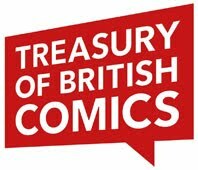 Guest Speakers include influential professionals from across the world of Comics and over the two days you will have the opportunity to join both short 2 hour workshops and full weekend courses plus everything in between. Some events are for beginners, whilst some are for more advanced creators. There are also one to one portfolio reviews with editors, meetings with distributors for self publishers and a catered networking party in the evenings to help you secure those valuable connections made during the day. This year we are also hosting a Self Publishing Summit for independent creators and self publishers to discuss ideas for producing and promoting their work and to learn more about branding and marketing their own intelectual properties. 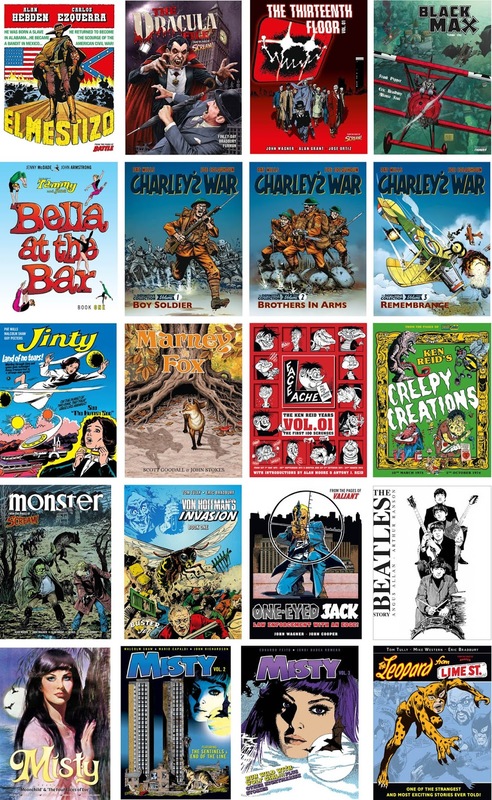 If you are serious about a career in comics and graphic novels then Comics Uncovered is the one essentail event on the calendar for you every other year! A new graphic novel from London publisher Selfmadehero is arriving soon, and it sounds great! 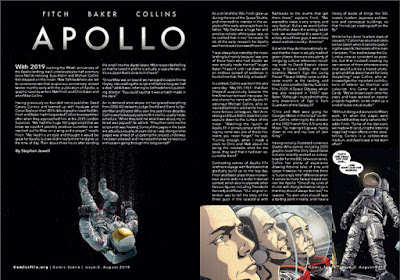 SelfMadeHero are delighted to announce the UK release of APOLLO, the dramatic account of that one giant leap for mankind in 1969 when man first set foot on the moon, from an all british team of creators. 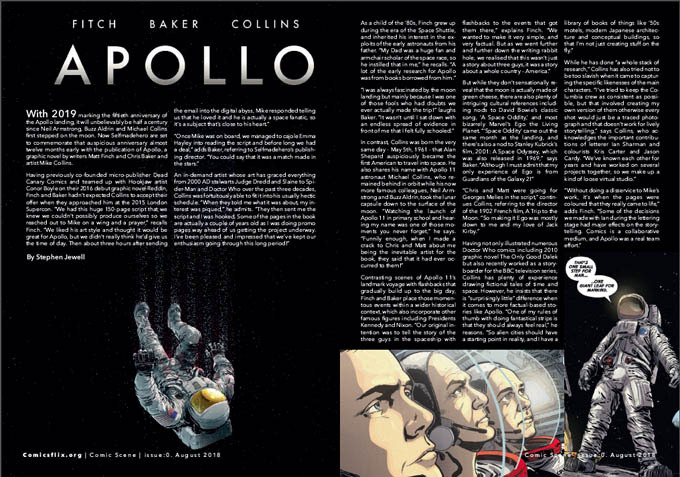 Renowned writers Matt Fitch and Chris Baker team up with prolific illustrator Mike Collins (Doctor Who, Wonder Woman, Judge Dredd) to bring the story of Neil Armstrong, Buzz Aldrin and Michael Collins’ momentous voyage to graphic novel form. 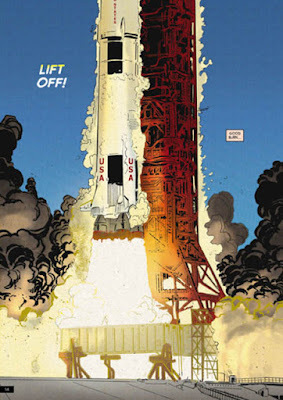 1969 saw one giant leap for mankind when the first man set foot on the moon. Neil Armstrong, Edwin ‘Buzz’ Aldrin and Michael Collins were the torchbearers for our collective aspirations. 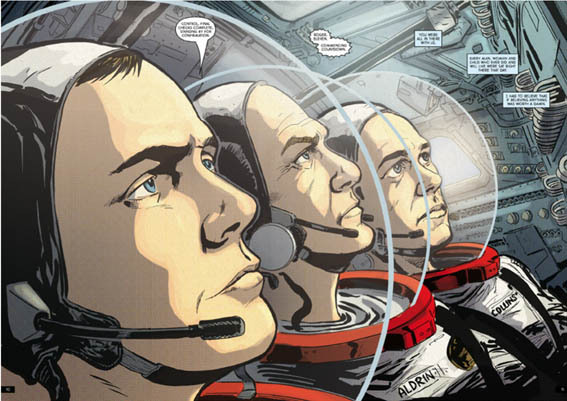 Backed by the brightest minds in engineering and science, the three boarded a rocket and flew through the void – just to prove that we could. An all-British creative team tells the story of this historic moment. Writers Matt Fitch and Chris Baker (Dead Canary Comics) have teamed up with artist Mike Collins, the prolific illustrator of characters including Batman, Judge Dredd and Doctor Who, to unpack the urban legends, the gossip and the speculation to reveal a remarkable true story about life, death, dreams and the reality of humanity’s greatest exploratory achievement. 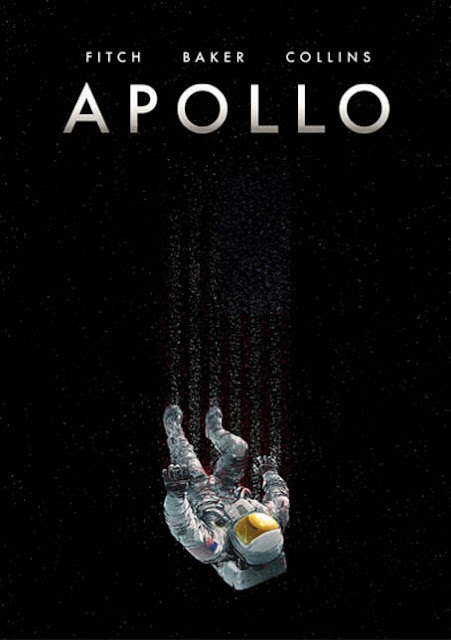 Supported by extensive research from books, official documents and recordings, Apollo offers an authentic and unique account of this historic event ahead of its 50th anniversary celebrations. Mike Collins is a comic book artist based in Wales. 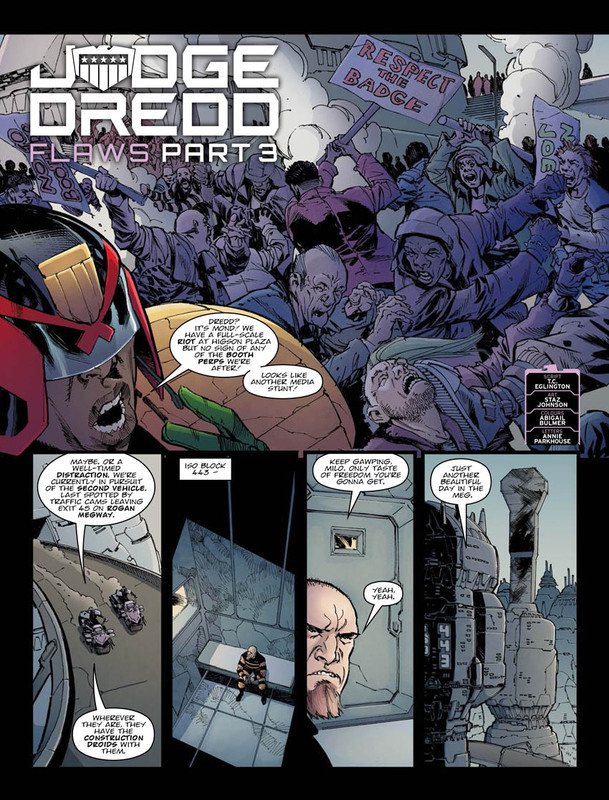 He has worked for Marvel UK on comics including Spider-man and Transformers; for DC Comics on flagship titles such as Batman, Superman and Wonder Woman, and for the UK’s celebrated weekly comic 2000AD on Judge Dredd, Slaine and Rogue Trooper, among others. 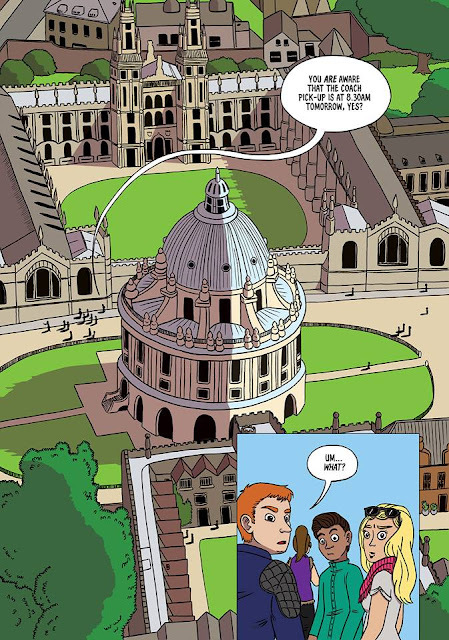 Matt Fitch and Chris Baker are co-founders of Dead Canary Comics, a small press dedicated to comics and graphic novels. Together they are the authors to Reddin (with Conor Boyle) and The Fitzroy, a collection of stories featuring artwork by Krent Able, Charlie Hodgson, Will Ronson, Scott Cooper and Will Kirkby. SelfMadeHero publishes works that provoke, entertain, inspire and inform through the medium of the graphic novel. The company is proud to showcase ground-breaking and beautiful work by authors and artists from across the globe, from the quirky and humorous to the political and profound. Releases for Spring 2018 include Jean-Pierre Filiu and David B.’s Best of Enemies, Vol 3; Andrzej Klimowski’s Poster Book; Reinhard Kleist’s Nick Cave & The Bad Seeds: An Art Book; Jesús Carrasco and Javi Rey’s Out in the Open; John Harris Dunning & Michael Kennedy’s Tumult; and Martin Rowson’s The Communist Manifesto. 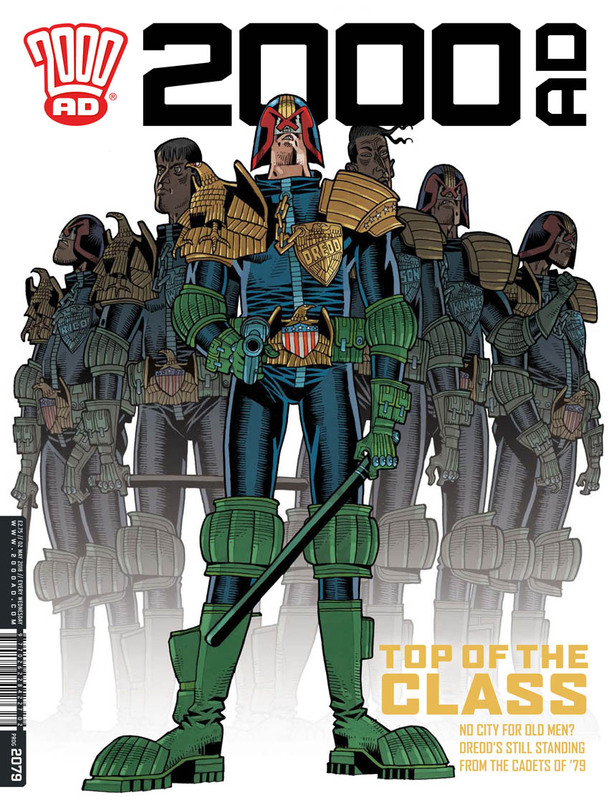 Here's a preview of what's coming up in 2000AD, including a stunning cover by one of Judge Dredd's original artists, Mick McMahon. 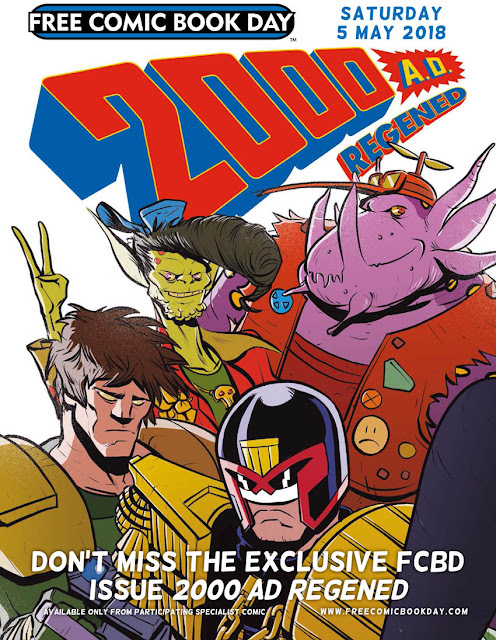 That's what's coming on Wednesday 2nd May, but don't forget that next Saturday (5th May) is Free Comic Book Day at participating comic shops, and amongst the freebies on offer will be 2000AD Regened, an all-new, all-ages 2000AD special! Don't miss it! 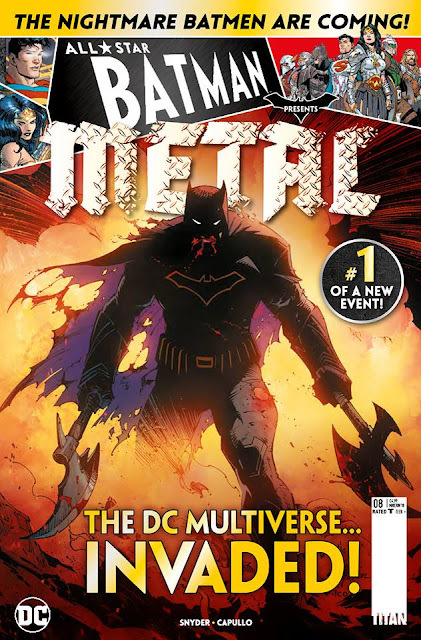 Out now from Titan Magazines, All-Star Batman’s new epic event, Dark Knights Metal! 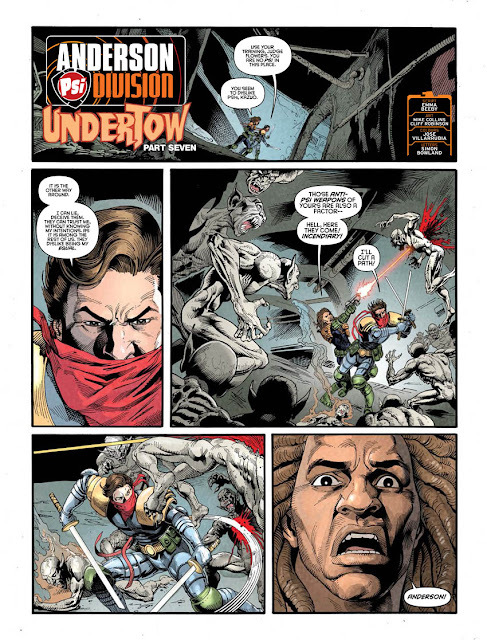 In this new series, prepare to see the darkest worlds collide with the DC Universe. The mysterious Dark Knights are coming, and only Batman can solve the riddle of the Dark Multiverse! 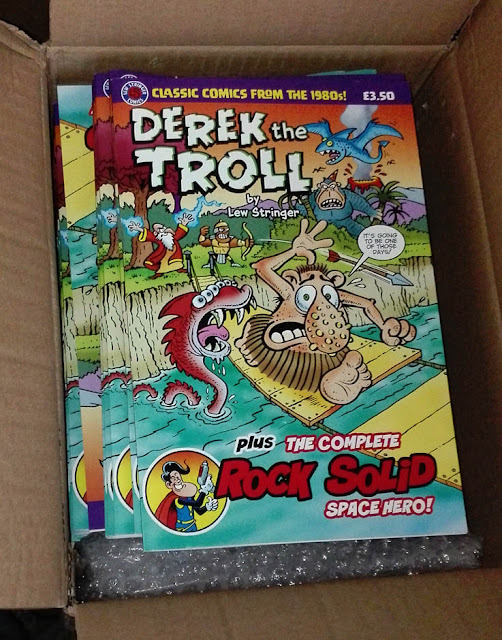 Just arrived from the printers this morning: my comic Derek the Troll is back in stock! The first printing sold out recently so I've had a second printing done. 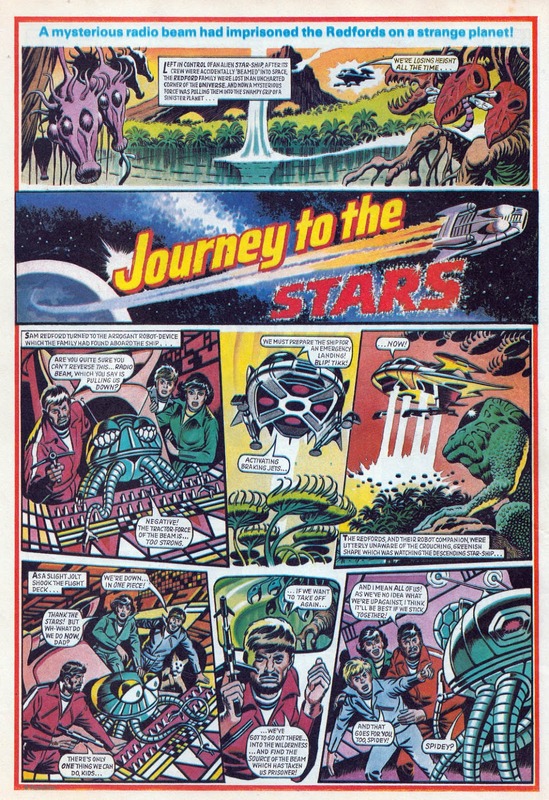 It reprints some of my earliest professional work from the mid-1980s. 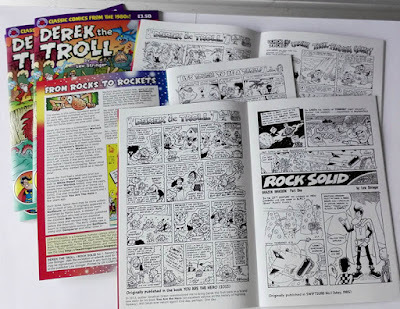 All the Derek the Troll strips from Warlock and White Dwarf plus the complete Rock Solid, Space Hero serial from Swiftsure Nos.1 to 5. 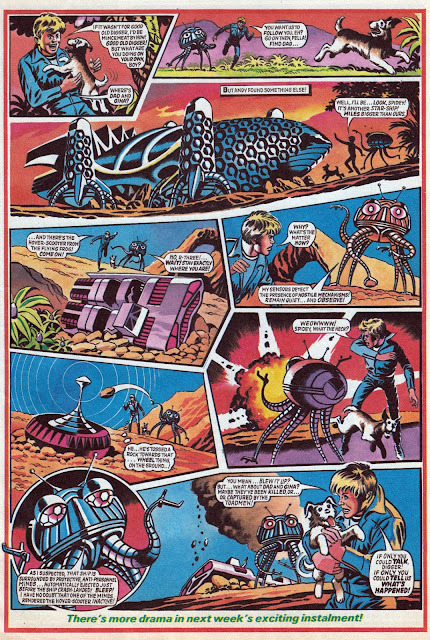 Hopefully, this is just the beginning, and we'll see many more classic British strips reprinted over the years to come. Which stories would you like to see Rebellion reprint? 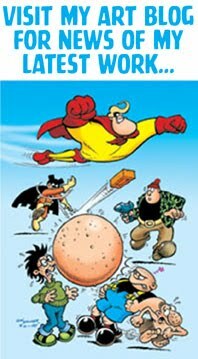 Remember, they only own the rights to the IPC comics published from 1970 onwards (with a few that fall prior to that, such as Whizzer and Chips which started in 1969, and Roy of the Rovers). Also, some material from Oink! is creator-owned, and the licensed titles such as Sonic the Comic or Thunderbirds are not part of the acquisition. Obviously, Rebellion will give preference to material that has the best potential to sell, so a collection of Gus Gorilla strips from Cor!! probably isn't likely to be part of their future plans. 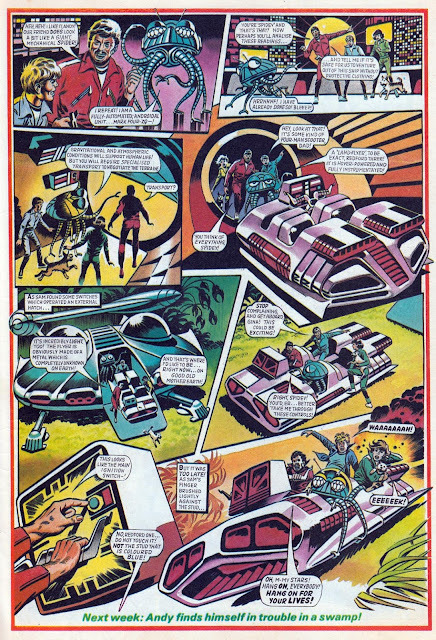 On the other hand, a collection of Dredger strips from Action could work, I think. So... what would you like to see? It's very rare for Panini's Marvel Collectors' Editions to carry free gifts, - in fact I think it's been several years since the last one, - but Marvel Legends No.23, out today, has a cover mount of a pack of Marvel Trading Cards. (A similar gift was also with last week's Avengers Universe, so they may be given away with other Marvel titles soon too.) It's a good way to attract the attention of kids who have just been to see Avengers: Infinity War! Marvel Legends Vol. 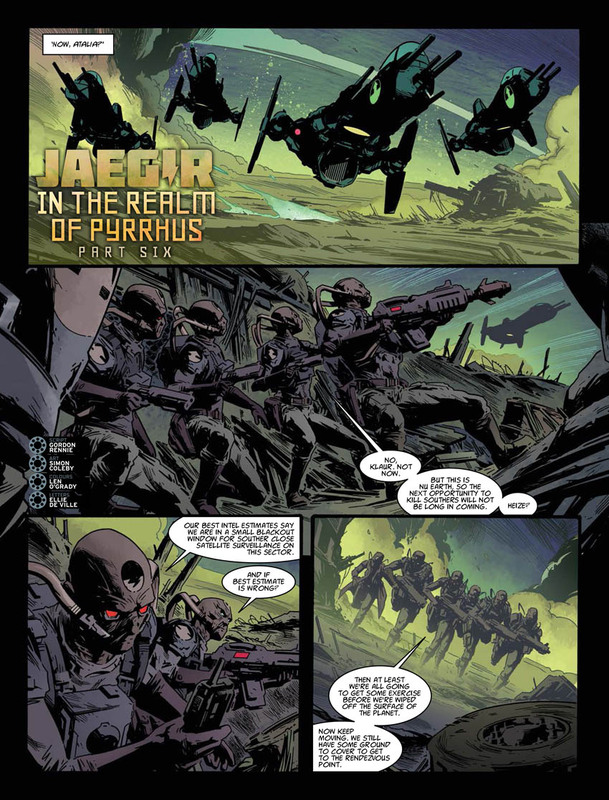 3 #23. On sale 26th April 2018. FREE MARVEL TRADING CARDS! 76 Action-Packed pages featuring Marvel’s ‘Big 3’ – Iron Man, Captain America and Thor! £3.99! Plus, Ironheart is the new queen of Latveria! Finally, to reclaim his honour and the hammer of Ultimate Thor, the Odinson battles the Collector and Thanos’s Black Order! 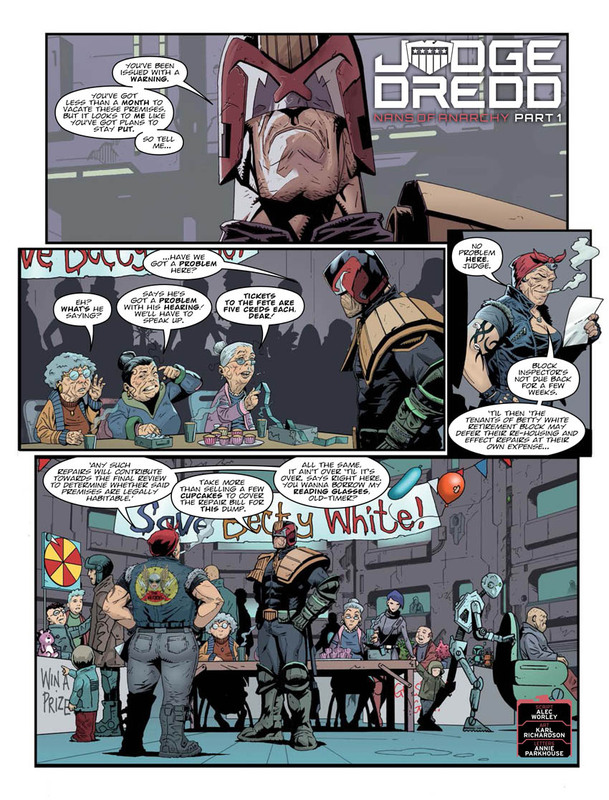 By Nick Spencer, Andres Guinaldo, Javier Pina, Yildiray Çinar, Kevin Libranda, Jon Malin, Brian Michael Bendis, Stefano Caselli, Jason Aaron and Olivier Coipel! 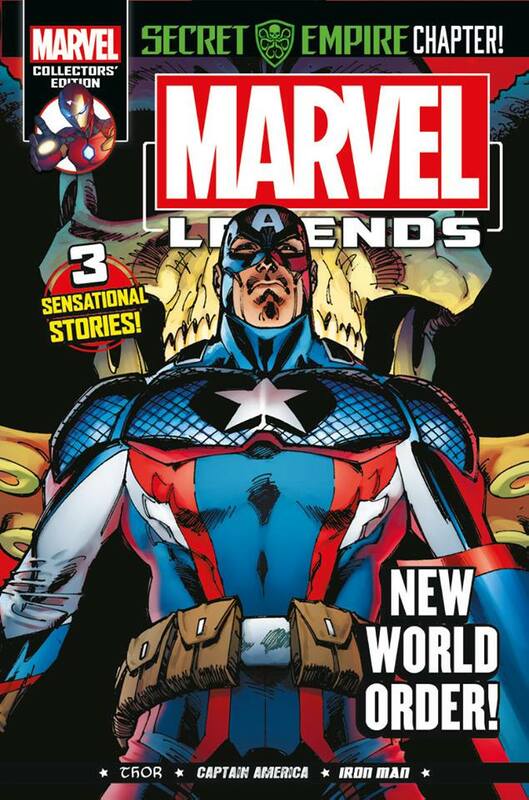 Includes material reprinted from Captain America: Steve Rogers #17, Invincible Iron Man #10 and Unworthy Thor #4! 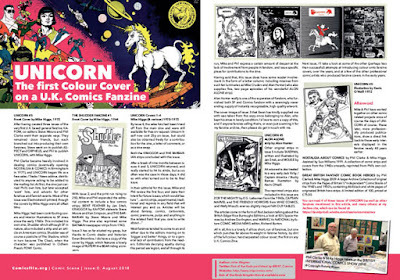 On sale from WH Smith, selected newsagents, and comic shops. 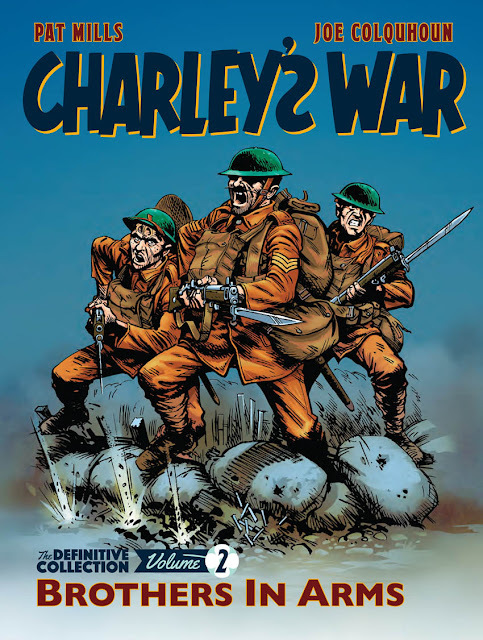 The next book in Rebellion's Treasury of British Comics line will be the second volume of Charley's War: The Definitive Collection. Hot on the heels of Vol.1 which was released last week, Volume 2 will be published on May 17th. Volume 2, subtitled Brothers In Arms, will be another chunky softback of over 330 pages, reprinting the classic WW1 story by Pat Mills and Joe Colquhoun. 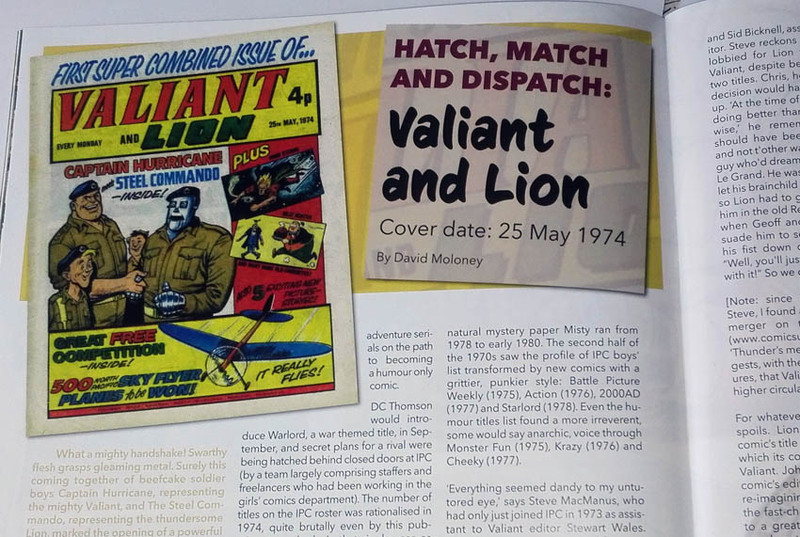 This edition covers the stories from Battle Action from late 1980 to mid 1982. The horrors of the war continue, and this time we're given the story of a deserter, the British mutiny, and Charlie's encounters with the sadistic British officer Captain Snell. 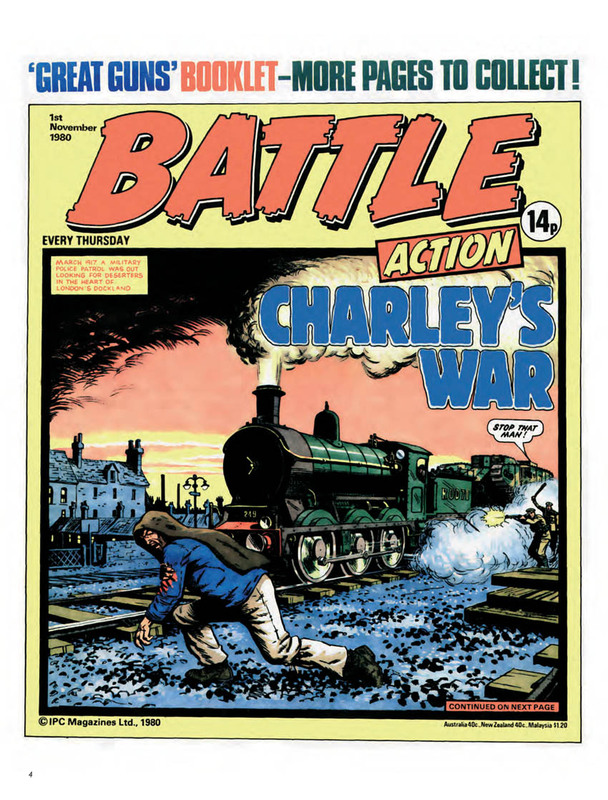 When these stories first appeared in Battle-Action, the comic was sadly past its best, but Charley's War was a true gem. 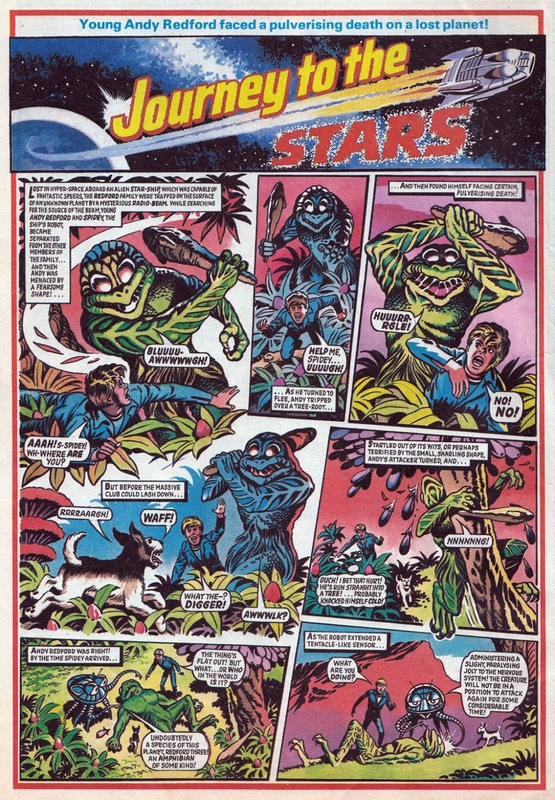 Indeed, it would even have stood head and shoulders above the contents of any comic, such was the high standard of the creative team. Pat Mills' dedicated research into the subject matter, combined with his skills of writing a gripping adventure story, made the strip unmissable, and Joe Colquhoun's powerful, detailed, and emotive artwork was the perfect match. Back in the day, I was buying Battle-Action solely for Charley's War, and would carefully cut out those pages in order to staple each story arc together into makeshift books. Now that we have these Definitive Collections, better printed than the original comics, I'll be replacing my yellowing old pages with these handsome books. Injured in The Battle of the Somme, Charley returns to wartime London and meets a deserter from the French Foreign Legion, Blue, who tells of his brutal experiences of the Battle of Verdun. All too soon Charley returns to the front line at Ypres where the threat from the German army is matched only by the inhumanity of his superiors! In the face of suffering and injustice, seeds of mutiny begin to grow among the ranks… This second volume of Pat Mills and Joe Colquhoun’s masterpiece continues to tell the story of an ordinary soldier’s experiences in World War One, including the vibrant re-mastered colour pages from the original comic. What's this? 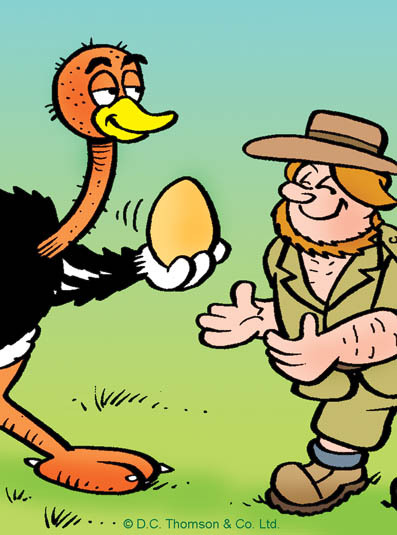 Has Big Eggo finally found his egg? 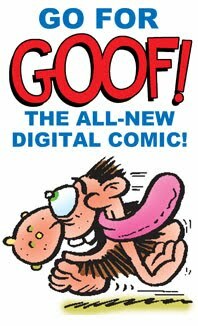 Has Terry Tuff captured him at last? 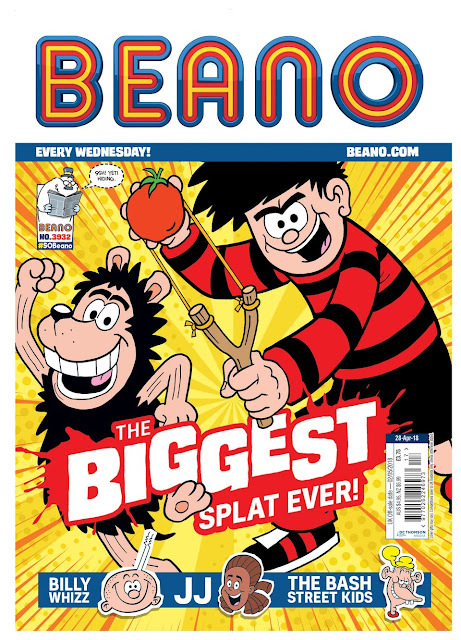 Find out in Beano No.3932, out now! The Beano's famous crimefighter Billy the Cat first appeared in a 1/4 page teaser ad (above) in the Easter 1967 issue of The Beano (No.1288). 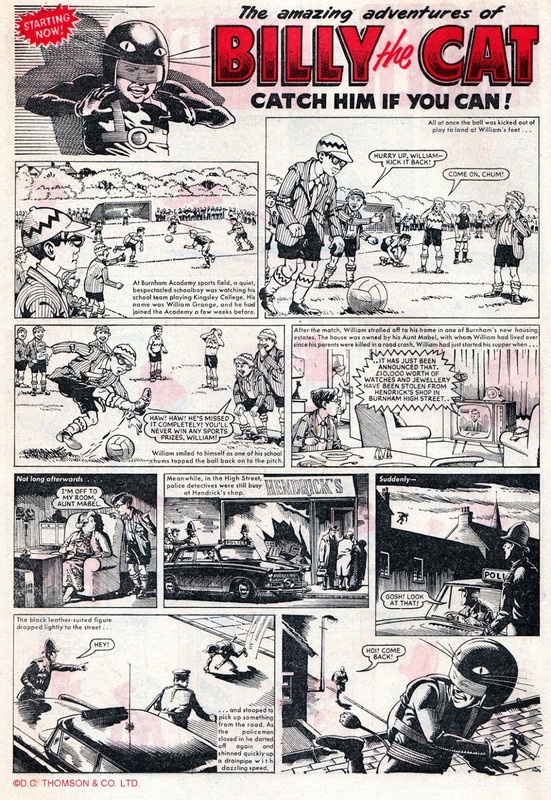 His strip began the following week, in The Beano No.1289, dated April 1st 1967. Although this was the April Fool themed issue, there was no mention of that in Billy's debut strip. 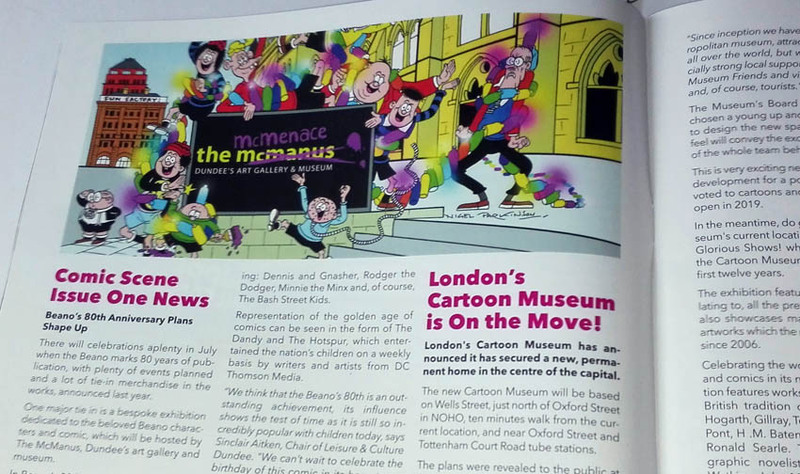 The Beano has revived Billy the Cat on occasion, drawn by various artists including Wayne Thompson, Nigel Dobbyn, and Laura Howell. With the current popularity of superheroes, and this being The Beano's 80th anniversary year, it'd be nice to see him return again. My choice would be Steve Beckett as artist, as he's another creator who can switch from humour to adventure, and he has that suitable light adventure style that works well in The Beano. 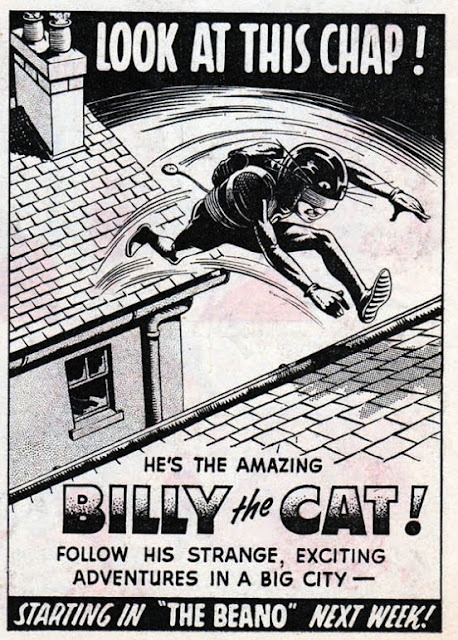 Will Billy the Cat return? I've no idea, but time will tell. These days, free gifts in comics are usually promoted on the polybag they're kept in. Before that, they'd be mentioned on the front cover, often accompanied by an illustration of said gift in action. Back in 1932, this "Happy Gift Number" of Illustrated Chips didn't show the "Splendid Toy Pistol" it was giving away but the occasion did merit a fancy celebratory masthead. 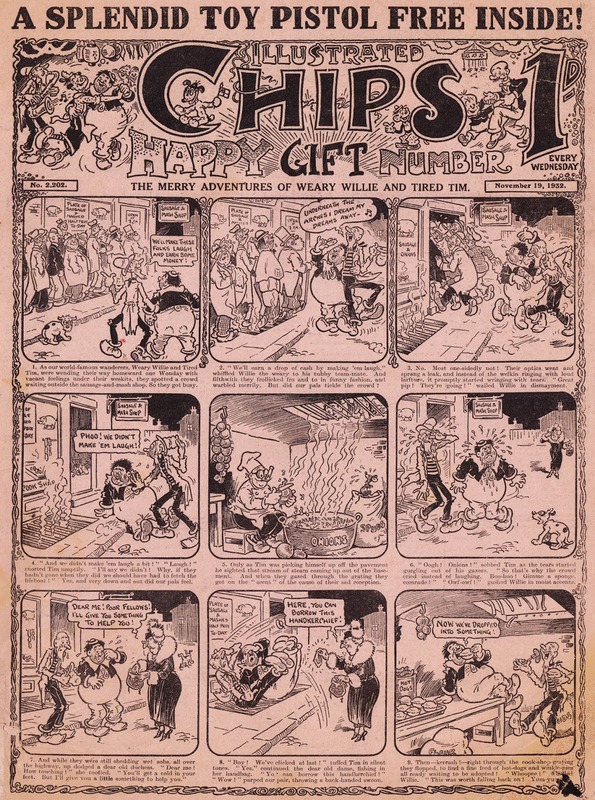 As ever, those jolly wandering tramps Weary Willie and Tired Tim held the cover position, drawn by Percy Cocking. 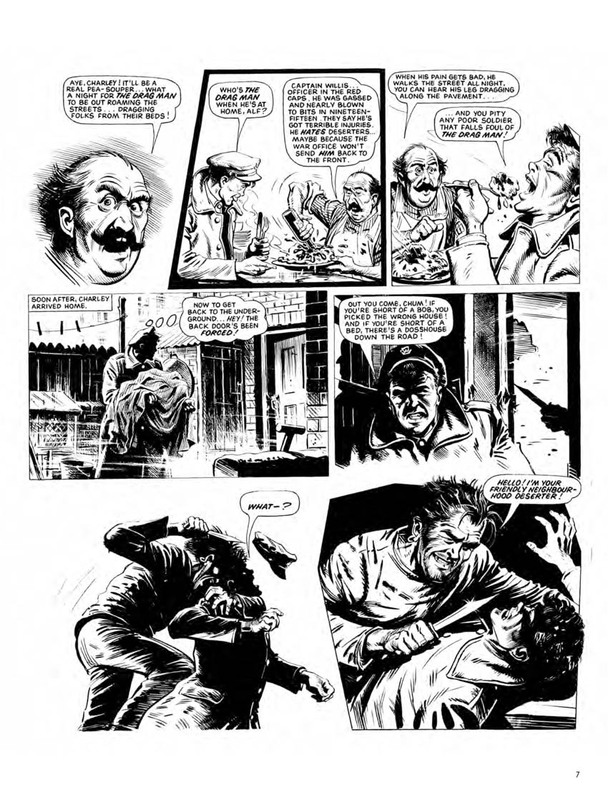 I've always liked comics of this period; the storylines are basic and contrived but the art is so full of life and expression. 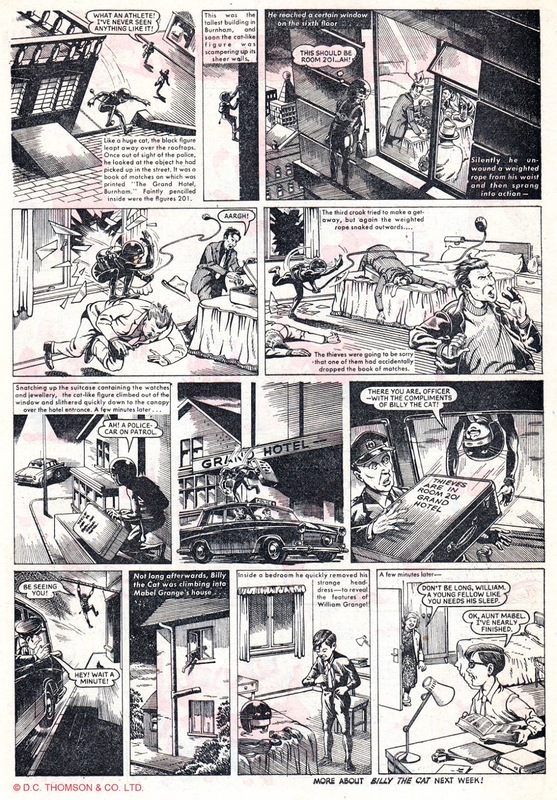 The long tradition of British comics giving away toy guns continues to this day, except now they're called "blasters" (never guns or pistols) and they shoot sponge darts. U.S. News: Action Comics reaches issue 1000 today! It's been 80 years since Superman first appeared and it's a double celebration as his original long running title Action Comics reaches issue 1000 today! 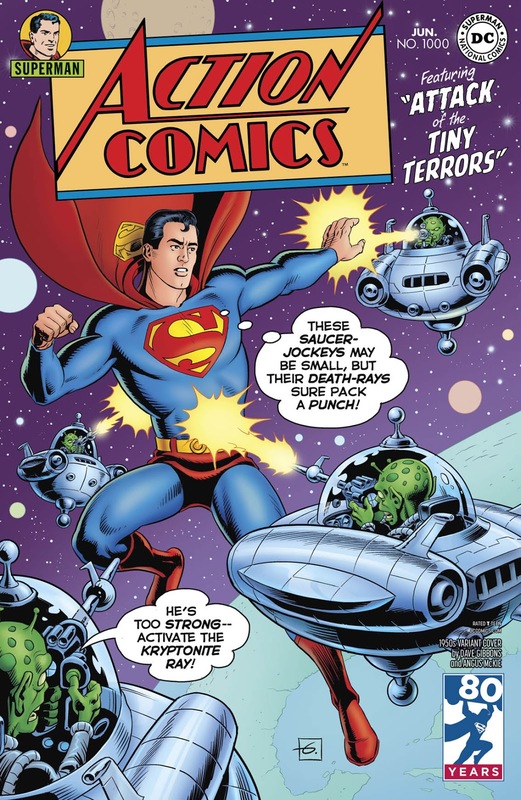 On sale in comic shops across the USA and UK, Action Comics No.1000 is an 80 page giant and features a choice of variant covers designed in the style of each decade. 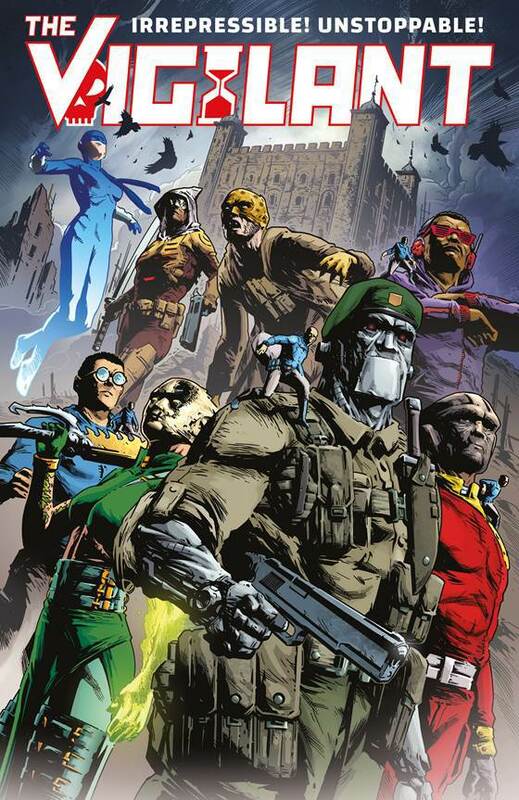 The UK's own Dave Gibbons has drawn the cover representing the 1950s issues. 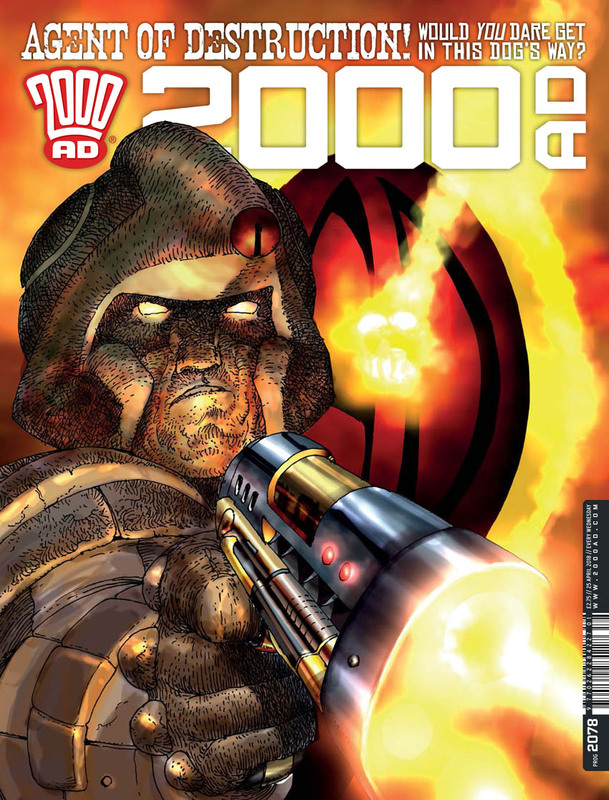 I'm sure Dave's younger self back in the late '50s could never have imagined he'd one day be drawing the cover for the 1000th edition! ...PLUS A BLANK VARIANT COVER! 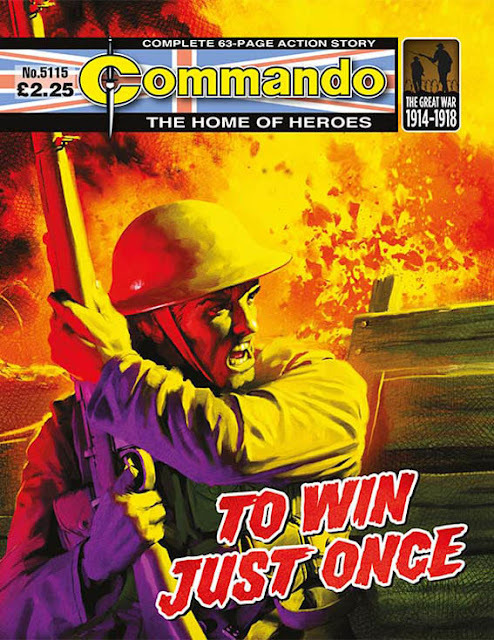 Direct from D.C. Thomson, here's the news on the four issues of Commando that will be in the shops this week. Brand new Commando issues #5115-5118 are coming soon! Storm Jerry lines at Messines Ridge, blast Bettys in a Buffalo, tunnel under the trenches with Maori Miners, and defend a Scottish island from an infiltrating U-Boat! It’s all in a day’s work for our Commandos! Andrew Knighton’s debut issue of Commando treats the First World War with gravitas, perfectly balancing developed characters and white-knuckle action. 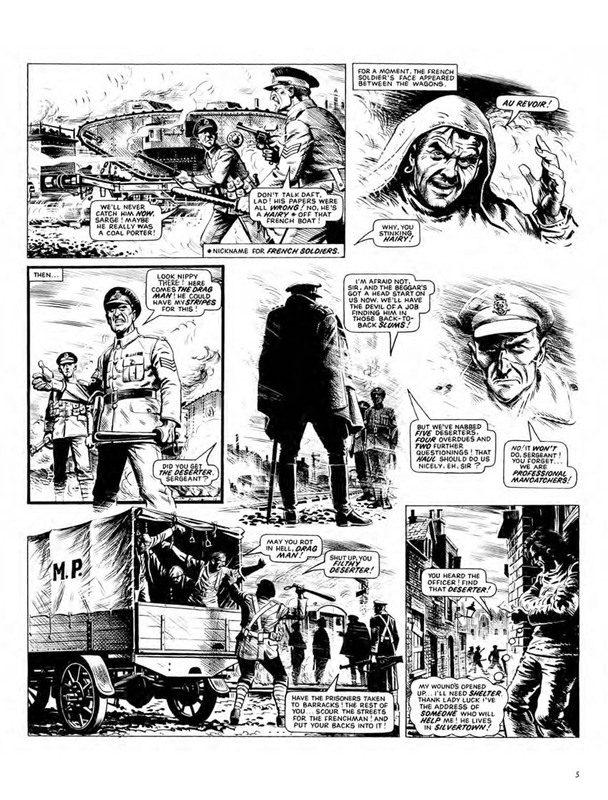 Accompanied by meticulous interiors from Vicente Alcazar, the intensity of the trenches is felt on every page, especially the prodigious wrap-around cover from Neil Roberts. Dave Kerr just wanted to be an RAF pilot but, even though he was a skilled flyer, he failed every exam. Sent to Singapore along with his pilot friend Patrick Elliot, Dave ran to Patrick’s tent to wake him when the Squadron Leader called in a scramble but found him asleep, pushed to exhaustion. Dave knew what he had to do — he grabbed Patrick’s flying helmet and goggles and ran for his Buffalo! An unusually vibrant background for an Ian Kennedy cover, the burning orange sets an explosive backdrop for the duelling Buffalo and Betty, preparing us for the aerial onslaught Mira skilfully provides inside. Originally Commando No. 519 (December 1970). Digging the Medieval tunnels deep beneath Arras in France, the New Zealand infantrymen thought they were tunnelling into Hell itself. With the ground above them frosted, the caverns underneath were icy, but the soldiers made it their own. They knew that after the losses at Verdun and the Somme, their only chance of defeating the Germans above was to dig beneath them. But what if the Germans had the same plan? First time Commando writer Jason Cobley’s refreshing focus on the New Zealand Tunnellers and the Maori Pioneer Battalion in the First World War is compelling in its detail, including the graffiti and place names marked in the eponymous Arras tunnels, which Carlos Pino details in his claustrophobic, yet homely interiors. When a U-Boat surfaces offshore from a remote Scottish island with nothing but a radio station run by the Royal Signals on it, Charlie Potter of the Intelligence Corps knew their only chance was to fight back. The invading SS waved the white flag, telling the Britishers that if they surrendered they would be spared, but Charlie knew that the Nazis would never take prisoners on to a submarine. With cover art from Mike Dorey of DC Thomson, IPC and 2000AD fame, the hazy fog and choppy waves surrounding the Scottish island are like something straight from ‘When Eight Bells Toll’. This combined with Mike Knowles tale of trouble seeking anti-hero Charlie Potter and veteran Commando artist CT Rigby’s interiors makes this a classic boys’ adventure comic for any age. Originally Commando No. 2741 (March 1994). 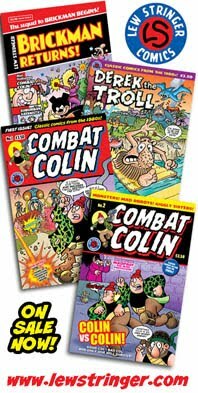 It's been several years since the UK had a magazine about British comics. The last one was Crikey! which ended in 2010. Now, Tony Foster has produced a brand new publication; Comic Scene UK, which launched at the Edinburgh Comic Con last weekend. 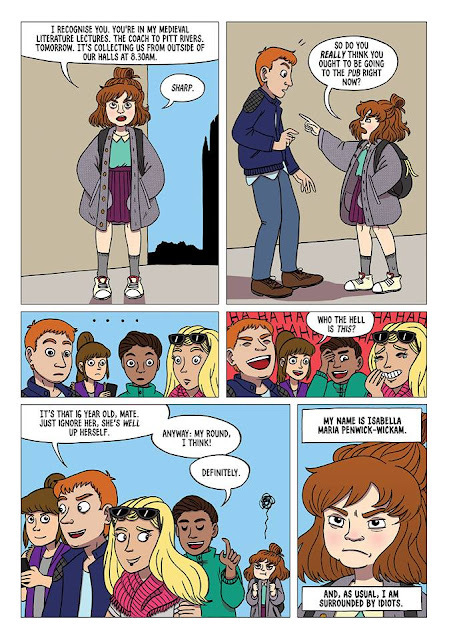 This is issue zero, with the actual first issue coming out in August. 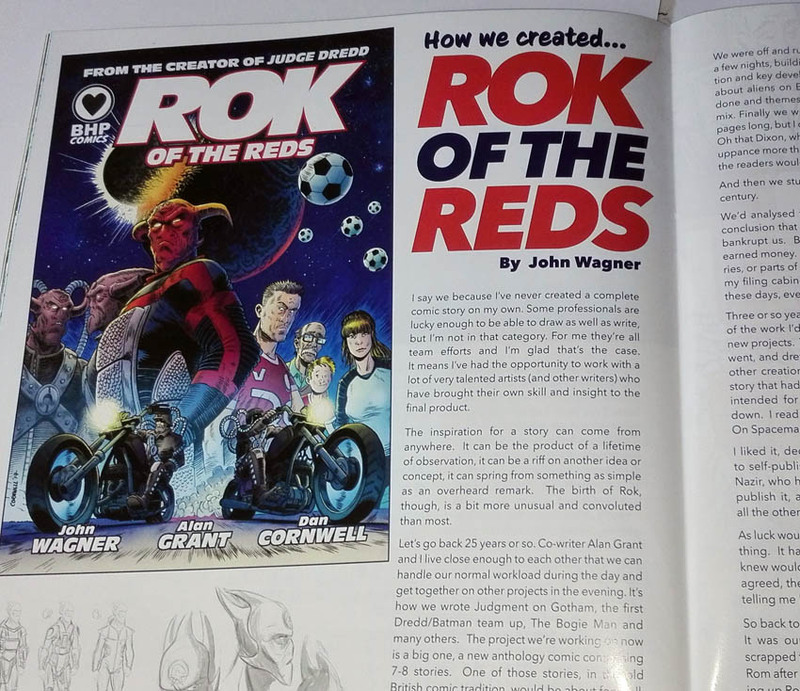 Tony's done a good job here, assembling a group of contributors that include fans and seasoned professionals such as Pat Mills, John Wagner, and John Freeman. 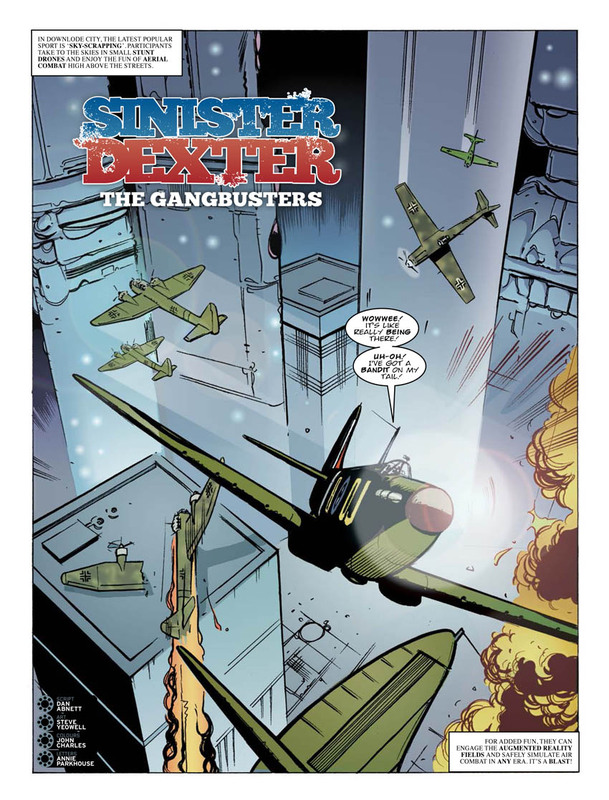 This 64 page debut issue features articles that include news on upcoming comics, reflections on comics long gone, and commentary on the industry. 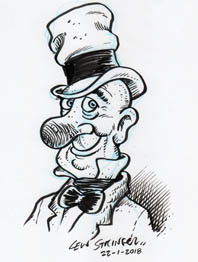 I would have liked to have seen an in-depth interview or two with comic creators on their careers to date. 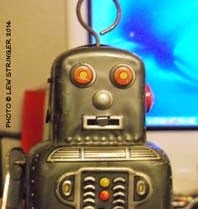 We don't really get that, but there are quotes and comments from creators about specific subjects. One highlight for me being reflections by Chris Lowder and Steve MacManus on their time at IPC during the Valiant and Lion merger. There's a handful of strips too. 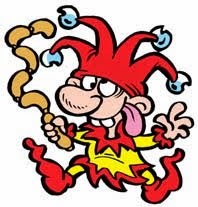 Marc Jackson brings us Whackoman! while Tom J. Farmer, Jose Rodriguez Mota and Valentina Muzzo present us with Captain Scotland, and Jim Wilkins does Deja Who? 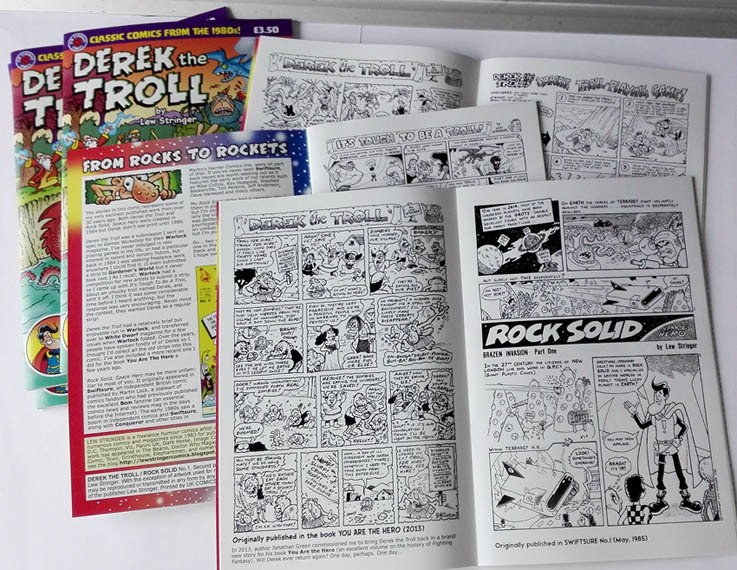 Most of the features only run to two pages, so there's a lot to read in the magazine's 64 full colour glossy pages on a variety of comics. 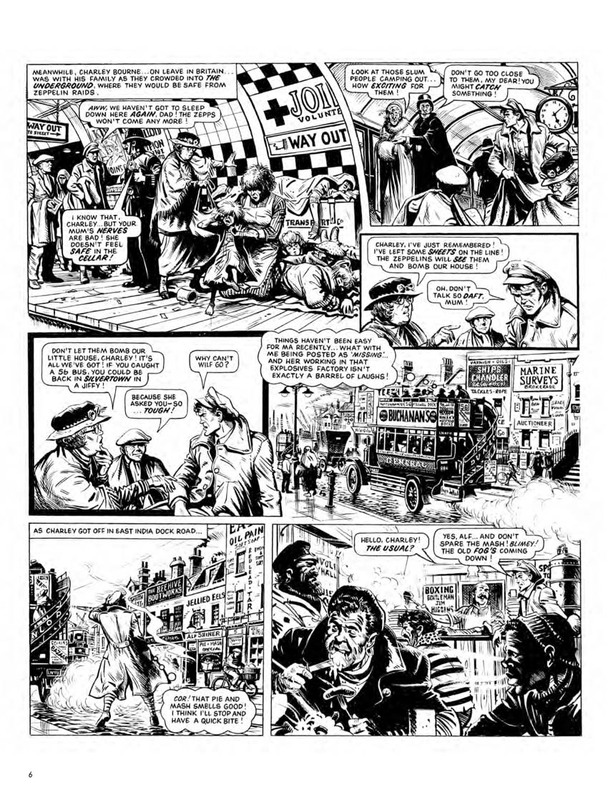 I'd have liked to have seen some coverage of the first half of comics history from the 19th Century to the 1950s but there's always room for that in future issues. Obviously it needs to focus on what people want to see, and in my experience, most fans mainly prefer comics from their own nostalgia, rather than those of the early 20th Century. 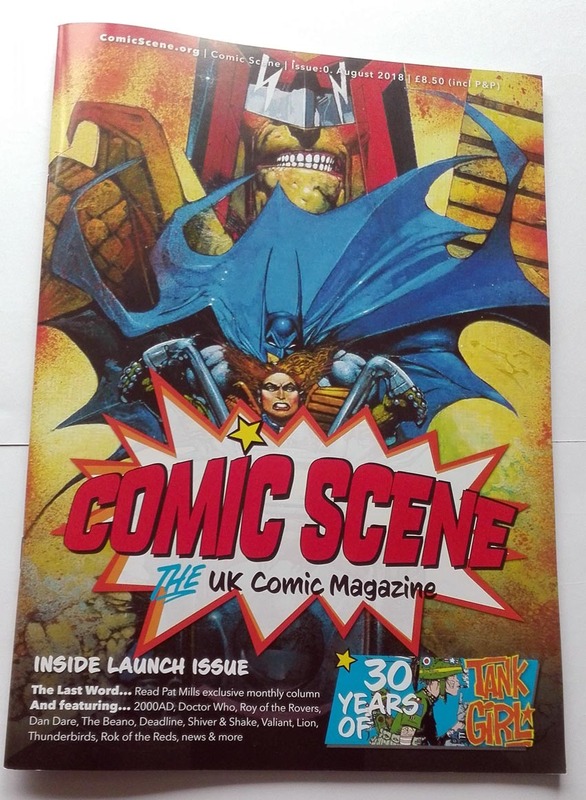 It's an impressive start, and I wish Comic Scene UK every success for the future. I hope readers will give it their support. 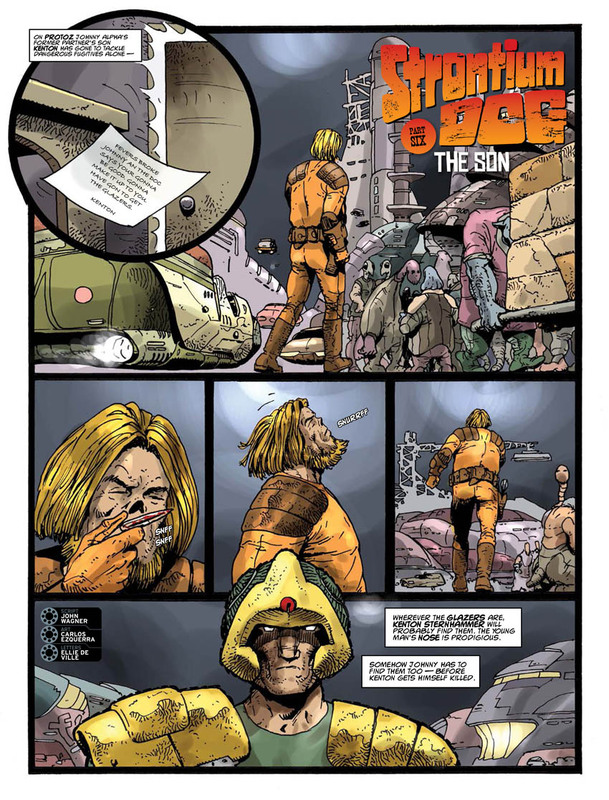 Dash to your newsagent on August 15th for The Vigilant, - a new one-off comic from Rebellion. 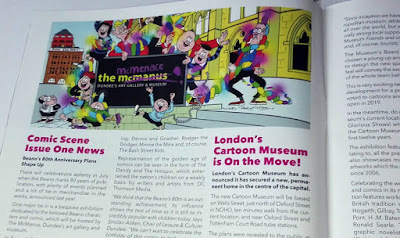 John Freeman has an exclusive about it on his blog, so dash there first!